Success after anxiety and trouble; self-esteem, beauty, conceit, but sometimes modesty therewith; dominance, patience, labour, etc. Tiphareth of Vav (Labour, work, journey by water). 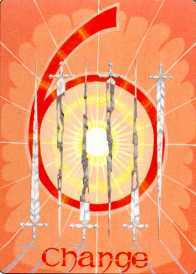 The Six of Swords is called Science. 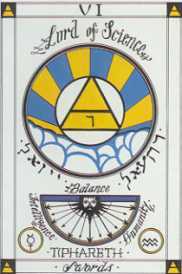 Its ruler is Mercury, so that the element of success turns away from the idea of division and quarrel; it is intelligence which has won to the goal. Additional Meanings: The voyage will be pleasant. Reversed: Unfavourable issue of lawsuit. 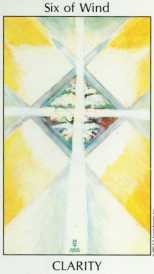 "With the establishment of Six, the energy descending down the Tree is finally in balance again." Six is the middle between above and below and between right and left. "As such, the four Sixes all partake of harmony, balance, and beauty in divinatory meaning, since Six represents the center of the Tree of Life." "Crowley refined the title for this key to "Science," denoting hard work, trial and error, and observation. This is in accord with the astrological conjunction of Mercury (as the God of language, word, and number) and Aquarius (as the intellectual mind in deep study). Waite's illustration is at odds with the above description... 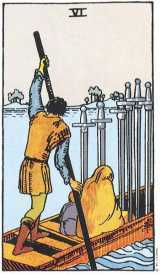 However, in Mathers' pamphlet The Tarot, the definition for the Six of Swords is "Envoy, messenger, voyage, travel." ... 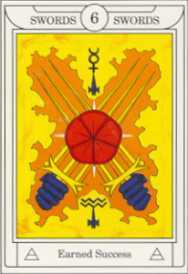 The astrological justification is that Mercury symbolizes the journey (as the God of roads), and Aquarius symbolizes water... Of all the pip cards, the Six of Swords is the most consistently misread in modern divination... in essence this card represents the mind in its most focused and attentive state, as Tiphareth (Six) of Air (Swords)." 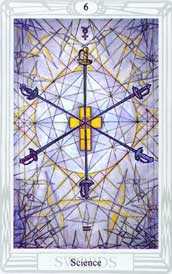 TWO hands, as before, each holding two swords which cross in the centre. Rose re-established thereon. 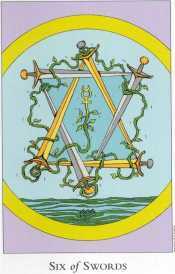 Mercury and Aquarius above and below, supported on the points of two short daggers or swords. 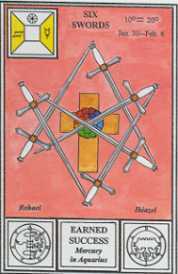 In "The Ritual of the Hexagram" (GD p. 287) The Hexagram is a powerful symbol representing the operation of the Seven Planets... signet or symbol of the Macrocosm... The Hexagram is composed of the two angles of Fire and Water... On p. 311 "Descent of the Divine Force into Tiphareth..." and "elevation of the Human into the Divine"
Illustrations from the Rider-Waite Tarot Deck, Hermetic Tarot, Ceremonial Tarot, Gill Tarot, Tarot of the Sephiroth, and Tarot of the Spirit reproduced by permission of U.S. Games Systems, Inc., Stamford, CT 06902 USA. Copyrights 1971, 1982, 1990, 2000, 1996 respectively by U.S. Games Systems, Inc. Further reproduction prohibited. 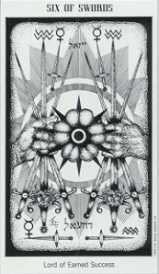 The Rider-Waite Tarot Deck* is a registered trademark of U.S.Games Systems, Inc.
Visit the worlds best source for tarot decks at www.usgamesinc.com.